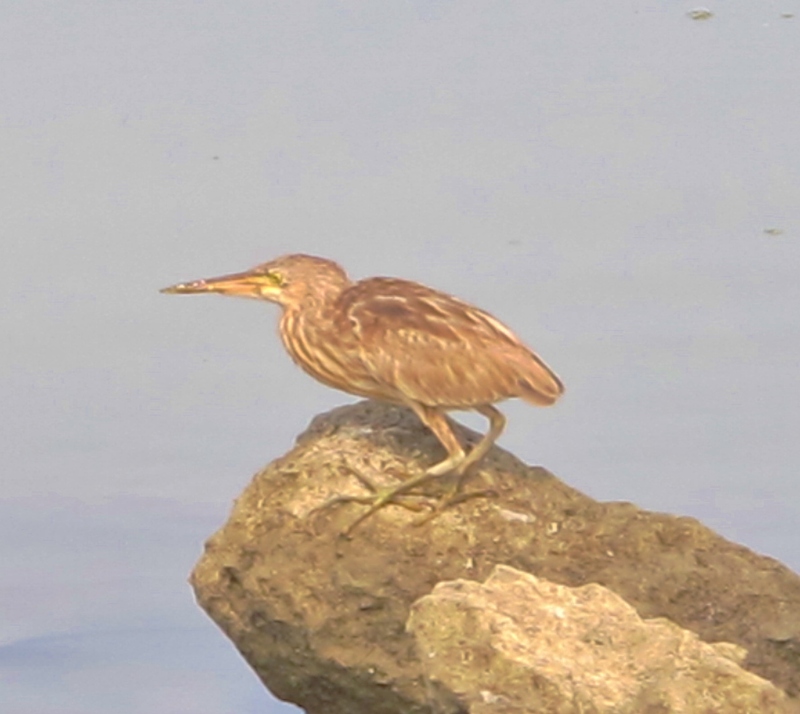 Yellow Bittern. A total of 8 were seen in the Dapeng Bay area on March 13th. Dapeng Bay is the largest coastal lagoon in southwest Taiwan, lying close to the town of Donggang in Pingtung County, about 45 minutes drive south of central Kaohsiung. I had no idea what to expect from the site, but decided to check it out in a few spare hours on Thursday morning. On arrival, the first thing I noticed was the amount of recent development here: a brand new multi-lane road skirting the bay, a big visitor center complex, and a very impressive suspension bridge. There were a few relict mangroves here and there, and one or two natural pools among the fish farms, but my immediate reaction was that this was a once-thriving wetland in the advanced stages of destruction – as is commonly seen in many parts of industrialised east Asia. Some areas have been designated as “wetlands”, and equipped with boardwalks, signboards and viewing towers, but none of the habitats I viewed seemed extensive enough to support a decent amount of birdlife. One gets the feeling that they are at best small concessions to the environmental lobby in return for large-scale development of the area for tourism. The rather depressing blurb on the Dapeng Bay website says it all: “With a yacht marina, G2 racing car circuit, a gyrocopter club, and other leisure facilities, in the future Dapeng Bay will transform into a world class seaside leisure and vacation destination for visitors from neighboring Asian countries”. Despite all the metaphorical red flags, I nonetheless explored around the bay a little and found a scattering of waders, most notably about 10 Long-toed Stints, and small numbers of common waders of 12 species including Marsh and Wood Sandpipers and Mongolian Plover. The natural wet areas and abandoned fish farm lakes were generally much more productive for birds than the designated “wetlands”, although a total of 8 Yellow Bitterns seemed rather indiscriminate in their choice of habitats. I left Dapeng Bay feeling that I would be unlikely to make a return visit, except perhaps as a brief stop sometime in the next few weeks when I head to Kenting to add Taiwan Bulbul and Taiwan Hwamei to the year list.